This event is part of the Climate Forward conference (to be registered for separately) that will explore the political obstacles to dealing with climate change and what the public and private sectors can and should do to lessen its impact. 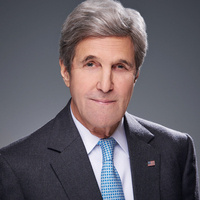 John Kerry is a former Secretary of State and five-term U.S. Senator. He is the author of Every Day Is Extra, A Call to Service: My Vision for a Better America, The New War, and the best-selling This Moment on Earth. He is currently a Distinguished Fellow for Global Affairs at Yale University as well as the inaugural Visiting Distinguished Statesman for the Carnegie Endowment for International Peace. Hosted in partnership by the USC Wrigley Institute for Environmental Studies, the USC Dornsife Center for the Political Future, and the USC Schwarzenegger Institute. Co-sponsored by USC Visions and Voices: The Arts and Humanities Initiative.